Note: This article was published by Iran Times. Spring's onset blesses our planet with a revival of beauty, bounty, and new life. As nature's rebirth begins, I hope our hearts and souls also bloom the new buds of love, compassion, and hope, which could bring about a much more peaceful, loving, and caring year for all of earth's inhabitants. Unfortunately, last year our world was plagued with wars and violence. Many people, including innocent children, women, and men have been killed or injured. Countless others suffer from insufficient food, shelter, and medicine. I pray to Hazrate Eshgh (the God of love) that this coming Noruz will be a healthy, happy, prosperous, harmonious, and peaceful year for every living creature on our beautiful planet, especially for my fellow Iranians and everyone who celebrates Noruz. I hope that a magical divine ray of love, wisdom, and humanity will shine through the hearts of all people and their leaders. I wish this would miraculously warm their hearts and enlighten their souls to make a genuine effort for eternal peace on Earth. On this wonderful and ancient occasion, I intend to highlight a few of Molana's teachings and insights, particularly for the younger generation who may not know him as well. 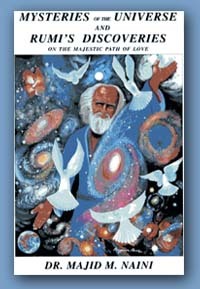 I hope that all of us remember these teachings in order to make the above wishes come to fruition. Molana has been the best selling poet for over a decade in the U.S. and other countries. UNESCO dedicated 2007 as the "Year of Rumi". Molana, through his higher senses in his times of jubilation and ecstasy, experienced the most astonishing visions about the realities and mysteries of our universe and our life journey. About 750 years ago Molana described such phenomena as force of gravity, nuclear explosion, spinning Earth and galaxies, matter and antimatter, our five higher senses, music's origin, and countless other scientific wonders that centuries later scientists "discovered". Above all, Molana's poetry emphasizes eternal love and the human journey and endeavor in the present life and beyond. 1. Molana declares that love is the reason for the creation of the universe. Love makes mountains dance and the whole universe sing a heavenly song of divine unity. Love surpasses all the boundaries of race, nationality, gender, religion, civilization, and culture. As love is universal, so is truth. My intention for the creation has been love (mercy). But to be generous to the creatures. Every particle benefited from God's Sun of mercy. When would I (God) have given existence to the universe. So you could comprehend the grandeur of love. Were it not for love, the world would perish. 2. Love is the miraculous force that quickens the flow of the energy of our souls and allows us to soar to the highest state of ecstasy in our majestic journey of life. Through love, all the ills of humanity can be cured. And I became an everlasting majesty myself. He will become like Gabriel and his evilness will die. The healer of all our ills. Oh (love), you are our Plato and Galen. Mountains began to dance and became agile. From love, king becomes servant. Being only physically alive, is a disgrace. 3. There is no death. Life is an everlasting journey through time and space within this universe and then beyond in timelessness. For the time being, we are stationed on the beautiful Earth, in the Solar System of the Milky Way Galaxy, in the Local Group Cluster, in the infinite Universe. From plant I was transformed to animal. Then why should I be afraid of death XE "death" ? I never became less from death XE "death" . and soar to become an angel XE "angel" . and become something that you cannot even imagine. 4. Whatever we do on Earth is recorded for eternity. This current life is like a dream and when our bodies die; it is then that we feel awake. It is this awakening which will reveal the consequences of our "earthly" deeds. The sleeper thinks that this is permanent. And he is freed from the darkness of suspicion and deception. When he sees his eternal place and home. Will appear to you at the time of awakening. Do not say that I will die and I will be freed. Do not expect to find him/her in a rose garden. 5. Clean the mirror of your heart and soul so you can access your five higher senses. There are five other (spiritual) senses XE "senses"
besides our five (bodily) senses XE "senses" . these (bodily) senses XE "senses" are like copper. It will also open your heart. You will see images beyond the water and soil (the Earth). 6. Love, tolerance, and patience are the magical alchemy that accelerates the process of our spiritual growth. This could transform our violent and unkind world into a peaceful and harmonious one. IIf you realize, is a hidden gold treasure. Because patience is the key to victory. They have often writhed in anguish from such snakes. You will reach the light of the prophets XE "prophets" ' traditions. 7. Happiness is a state of mind and thoughts. We should be their master and not their slave. For this reason they are broken hearted and sorrowful. The rest are bones and flesh. You are a flower garden. You are burning wood for fire. And if you are urine, you are poured out. Burn all thoughts and statements. Be happy, oh fierce love, the burner of all our ills. *All poetry translations are by Dr. Majid M. Naini and some are from his book, Mysteries of the Universe and Rumi's Discoveries on the Majestic Path of Love. About the author: Dr. Majid M. Naini, a Professor of Computer and Information Technology and former University Dean, is a leading Rumi scholar who has traveled over 400,000 miles throughout the world and has spoken at the United Nations and over 500 national and international conferences, seminars, and TV and radio programs since the tragic events of 9-11 to promote universal love, peace, and harmony and to enhance understanding and communication among people of all faiths, cultures, and backgrounds. He is the author of many books and articles including Mysteries of the Universe and Rumi's Discoveries on the Majestic Path of Love.